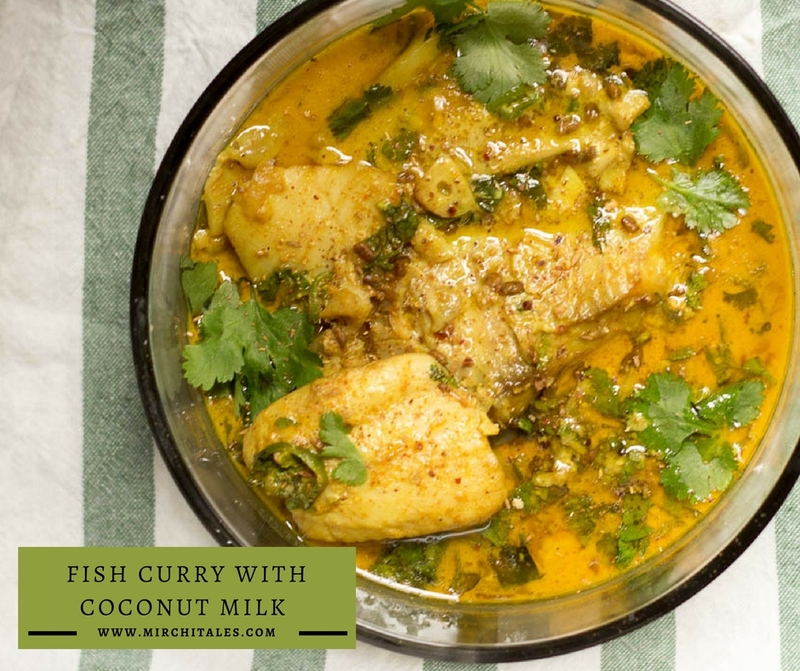 This fish curry with coconut milk is made with boneless fish fillets in a traditional Pakistani style salan with onions, yoghurt and spices and a can of coconut milk to make a rich and creamy gravy. 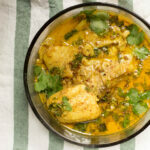 This fish curry is the first seafood recipe being posted on the blog. Fish was rarely cooked in our household growing up, and of course that’s why I never got the chance to cook with it. However, for the last few months, I have started experimenting with it, and come up with a couple of recipes that I really enjoy. All with boneless fish, though, as a whole fish is something I have yet to experiment with. 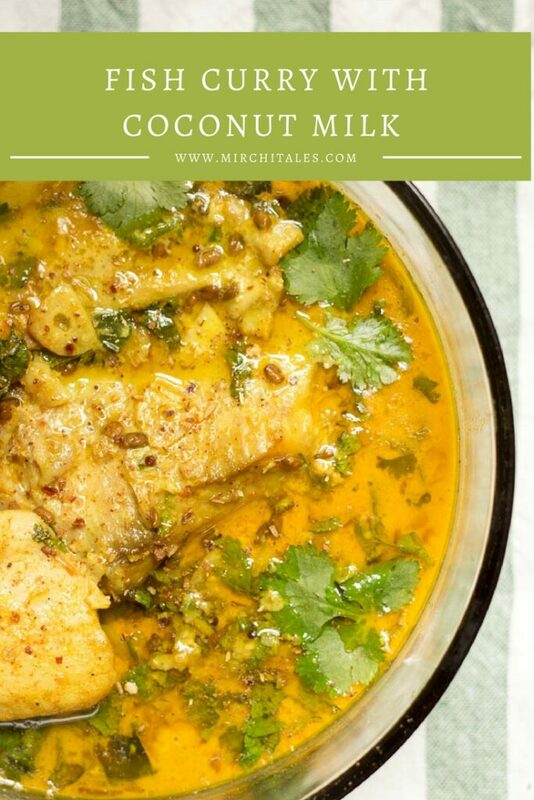 This recipe is a spicy fish curry or a fish ka salan made in a traditional Pakistani style with onions, chili and yogurt. But just at the end, a can of coconut milk is added to make a rich and creamy gravy that tastes absolutely decadent with steamed rice. The fish used in this recipe is skinless and boneless tilapia, cut into fillets. But in case not available, other fish varieties can be substituted instead. Apply vinegar on fish and wash after 10 minutes. This is to eliminate the possible odor from fish fillets. Marinate the fish fillets with garlic paste, and a pinch of salt. Let it sit for 10 minutes. Heat oil in a large skillet with deep edges. The gravy and the fish will be cooked in the same pan, so it needs to be large enough. Add fenugreek seeds, sliced garlic and mustard seeds. Once the garlic turns light golden and the mustard seeds release their aroma, add yoghurt. Add red chili powder, coriander powder, turmeric, salt and garam masala with the yoghurt. Fry for a few minutes till the oil starts releasing. Add the fish fillets at this stage, and fry for about 1 ½ - 2 minutes each side. Be careful in turning to make sure they don’t break. In case a large pan isn’t available, fry the fish in a separate pan in 2 or 3 batches, and then add it to the gravy. This is to ensure the fish gets fried properly without breaking. This step requires frying the fish fillets till crisp, not cooking them through. Add the coconut milk, and tilt the pan side-wards to mix, and avoid using a spoon as the fish can break. Let the mixture come to a light boil, turn heat to low, and cover. Cook on low heat till fish is cooked through. Once the fish is cooked through, add green chiles, coriander and lemon juice. Cook for another minute, and take off heat. Sprinkle with chaat masala and serve hot with rice or naan. How long do you think for the fish to be cooked thoroughly? It takes about 5 – 10 minutes for the fish to be cooked properly, but it also depends on the type of fish and size of fish fillet. I have used small fish fillets.